Diatomaceous Earth (DE) is a non-toxic natural insecticide mined from the fossilized silica shell remains of diatoms. Diatoms are single celled algae in the class Bacillarophyceae. It looks like a white powder and to humans it feels like white powder. When a pest insect gets some DE on its body, the DE absorbs the waxy layer on the surface of insect skins, causing the insect to lose moisture (desiccate). It also can work as an abrasive, rupturing cuticle cells. The product is labeled to control slugs, grasshoppers, millipedes, and sow bugs as well as soft bodied insects such as aphids. Warning - A different grade of DE is used as a filtering agent in swimming pools. Do not use that material as an insecticide! Both swimming-pool grade and natural types of DE come from the same source but are processed differently. It is imperative that only the "natural" grades be used for insect control. 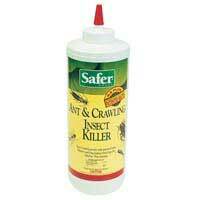 This natural insecticide uses DE to kill a variety of insects such as cockroaches, ants, earwigs, silverfish, crickets, millipedes and centipedes. It works indoors or out. It sontains amorphous diatomaceous earth (silicon dioxide),-an organic product. DIRECTIONS: unscrew cap and remove protective liner before using. Remove cap and cut tip above the top line with scissors or knife. INDOOR USE: COCKROACHES, ANTS, EARWIGS, SILVERFISH, CRICKETS, MILLIPEDES, AND CENTIPEDES. Lift open spout to desired setting and lightly coat a thin layer of duct in the areas where these pests are found or may hide such as cracks and crevices, behind and beneath stoves, refrigerators, sinks, cabinets, garbage cans, around pipes and drains, window frames, and in attics and basements. Hit insects directly where possible. Repeat treatment as necessary. OUTDOOR USE: EARWIGS, ANTS, CRICKETS, SLUGS, MILLIPEDES, AND CENTIPEDES. Lift open spout and lightly coat the areas where these pests are found or may hide including windows, door frames, and sills, and outside of entrance ways. Repeat treatment as necessary.